Clifford (Cliff") Foster was born on October 22, 1924, in Henderson Valley, Auckland, New Zealand; and was taken from his family and friends on July 20, 2003. Regarding his family, Cliff's mother was a schoolteacher, an accomplished horsewoman, a first-class rifle shot, and the first woman to swim in the New Zealand Champions using the American crawl. His father was a "Main Body" man on Gallipoli (WWI) and of outstanding valour. His father was wounded in France several times and died of his injuries, when Cliff was two years old. Cliff attended Otahuhu Technical High School where he was Captain of the 1st XV in Rugby, Captain of the 1st XI in Cricket, Best Shot in the Battalion, RSM of the Cadet Battalion, and Head Boy of the School. He was also the first Warrant Officer of No. 19 Town Squadron ATC. Clifford Foster began as an apprentice at MacEwan's Machinery, but left soon after the outbreak of the war (WWII). He joined the Royal New Zealand Air Force. He served in New Zealand, and in Operations at Guadalcanal and Bougainville. Upon the cessation of the hostilities, he returned to New Zealand, and then completed his apprenticeship, and worked as a toolmaker until he took up teaching in 1955. Cliff took on a Commission in the New Zealand Army (TF), at the same time, and qualified with distinction as Captain. He spent thirty (30) years at Avondale College. First he was a mathematics and technical teacher, then he was the head of their engineering department, head of the technical department, and finally Deputy Principal (for his last 7 1/2 years). Cliff was one of the few to reach Grade 5. He headed the Community Resource Group from its inception. He was Chief Examiner, in Education; and studied Principles and Practice of Teaching, and lectured to technical teachers. At one time, Cliff was Chairman of the Trinity Pakuranga Scout Group and he enjoyed camping activities, as part of this role. Shooting has always been Cliff's sport and hobby. He won the Auckland Rifle Association Championship, in 1956, while he was still a young "B" Grader. He taught the Elements of Shooting to thousands of cadets and scouts. He was several times "President." First he was President of Akarana, then of the Akarana City clubs. Cliff was President of the Auckland Rifle Association, and a lifetime member of both the aforementioned organizations. Clifford Foster's other accomplishments were that of being instrumental in getting the Magatawiri Rifle Range up and running as part of the 1990 Commonwealth Games. He was then appointed Director of full bore shooting for those games. Cliff represented his club in the 1956 Queen's Shoot, at the ANZAC Range in Sydney, Austrailia; and he has shot in a number of venues, in Australia, ever since. Clifford Foster had many other interests, besides that of shooting. 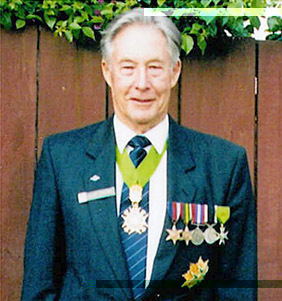 He was a long-time member of the Order of Saint Lazarus, a member of the Royal Returned Services Association (Eden-Roskill RSA), Mount Roskill Probus Club, and the Masonic Lodge. His hobbies of coin collecting and sketching, and his homelife kept him busy. Cliff married, his second wife, Katherine, in 1979 (at age 55). He and Katherine travelled extensively in New Zealand. First they travelled in caravans and later in motor homes. In the Military and Hospitalier Order of Saint Lazarus, Cliff was knighted and installed to the rank of Chevalier. Recently, he was promoted to the ranking of Knight Commander. Cliff served the Order of St. Lazarus as Commander of the Auckland Commandery. His drive, energy, and companionship will be sadly missed. Clifford Foster is survived by his wife Katherine and his children Lindsay, Glenn, Ian; and Jenny.